The townsfolk prepare to put Harold Hill (Michael Gruber, center) on musical trial. Photo by Devon Cox. Artistry is on a musical roll. The company’s striking new production of The Music Man follows last spring’s thrilling, melodramatic production of The Secret Garden. After years of flashy productions weighed down by muddy sound mixes and poor mic use in the Schneider Theatre, the company finally seems to have found a good acoustical groove in the past year for its often ambitious artistic programming. 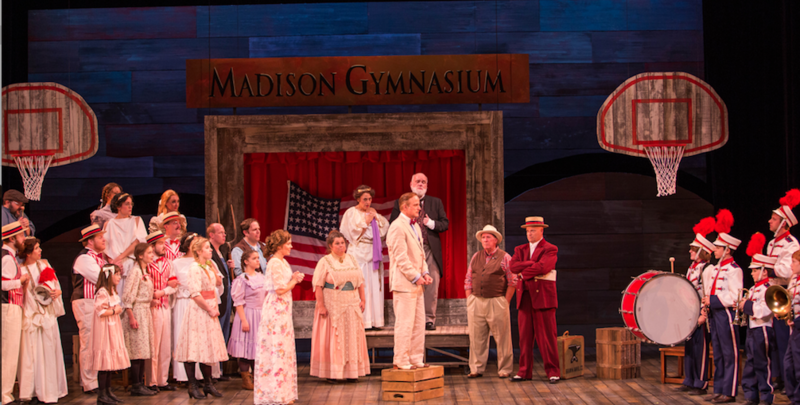 Something that this production of The Music Man most definitely has in spades is star power, starting with Michael Gruber’s commanding and charismatic performance as con man Harold Hill. Gruber, who doubles as the show’s choreographer, showcases the sort of slick delivery that used car salesmen aspire to, paired with a melodious voice and dashingly seductive smile. Seeing his powerhouse combo of “‘Ya Got Trouble” and “Seventy-Six Trombones”, it’s no wonder that the other salesmen want to run him out of town. Harold Hill (Michael Gruber) presents Winthrop (Liam Beck-O’Sullivan) with a flugelhorn while Marian (Jennifer Eckes) looks for evidence to roast Hill. Photo by Devon Cox. Gruber’s co-star in this production is Jennifer Eckes as Marian the librarian (say that three times fast) and local music teacher. 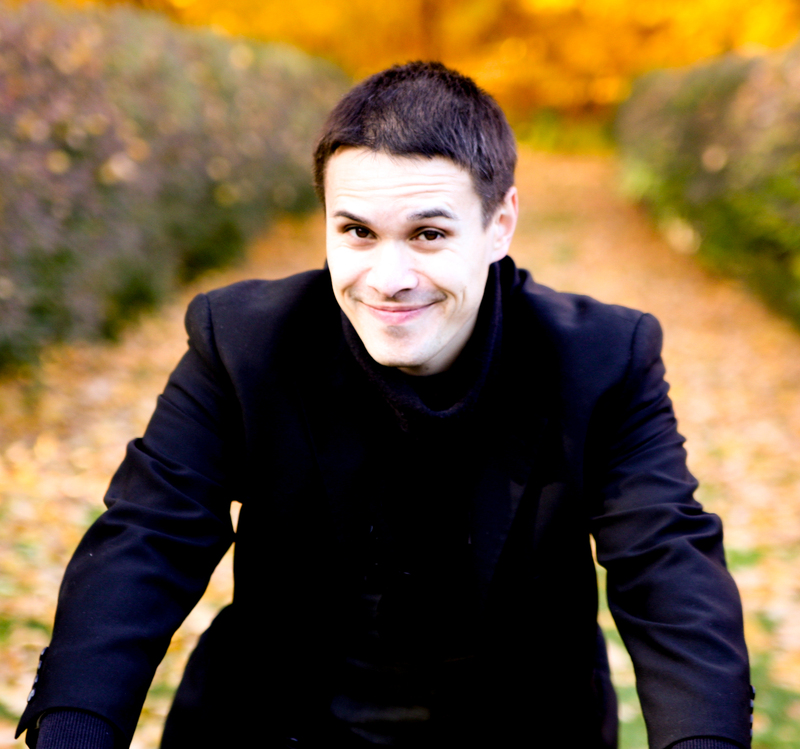 Eckes has an engaging gift for song, beautifully displayed in classics like “Goodnight My Someone” and “Will I Ever Tell You”. If Gruber’s primary job is to sell the town and the audience on Hill’s slickness, Eckes’ job is to sell the love story and Hill’s redemption arc. The pair have excellent on-stage chemistry and their eventual duet “‘Til There Was You” is one of the show highlights. 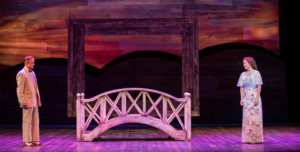 As rendered by director Angela Timberman, Artistry’s Music Man is filled with charming little touches that help sell us on the con, starting with elements like the cute cut-out train and wagon that play against the backdrop. The casting is excellent, showcasing one of the best vocal ensembles that Artistry has put on stage in recent years. The school board barbershop quartet (C. Ryan Shipley, Christian B. LaBissoniere, Joe McLaughlin, and Andrew Newman), often a weaker part of the show, shines and makes you want to hear more. The “Professor” and the Librarian (Michael Gruber and Jennifer Eckes) meet at the bridge. Photo by Devon Cox. 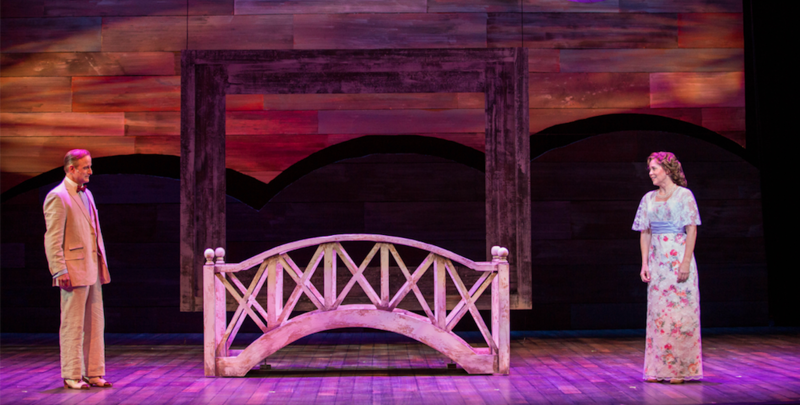 Gruber’s choreography is light on its feet, fun, and grounded in folk dancing, especially in the fluffy “Shipoopi”. The costumes (Ed Gleeman), set (Joel Sass), and lights (Grant E. Merges and Erin Belpedio) establish the period effectively and mostly stay out of the way of the action, a few special touches like a magical moon and the aforementioned train and wagon aside. 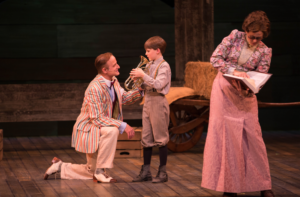 Artistry’s production of The Music Man plays at the Bloomington Center for the Arts through November 5.